The joys of childhood are a combination of so many elements: an enthusiasm for exploration and learning, sheer fun, playfulness. 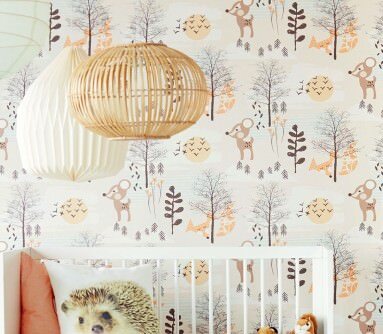 Our kids’ wallpapers help create the best environment for the little ones to thrive. The new range is stimulating and imaginative whilst also being functional. Our wall-coverings inspire, motivate; they are tactile and provide a way to analyse colours, motifs and patterns. Children love bright colours and interesting imagery, and our fresh designs feature, animals, flowers, phantasy worlds, heroes or feats of technology – fun and games guaranteed! Your precious offspring will be delighted: Our new designer wallpapers for kids’ rooms are a feast for the senses. Materials that are good for body and soul, calming or bright colours and funny motifs that appeal to children – there is something for everybody in our new range. Children know their mind when it comes to colours and pictures and should have their say in the choice of wall covering from an early age. They need space to play, explore, relax, and grow, and children’s rooms have to be multi-functional in order to provide the backdrop for a meeting of imagination and reality. 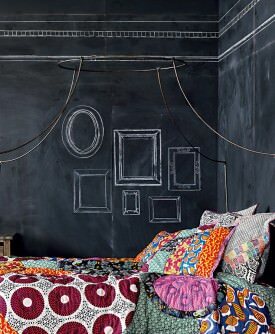 Children’s rooms should be colourful and vibrant. Childish joy, curiosity and playfulness need to be catered for. Our wallpapers for children’s rooms meet all the multi-facetted needs your little boy or girl might have and evoke a feeling of well-being and security. Not all girls like pink, and there is no need to with our choice of brightly coloured alternatives. Many boys and girls have a penchant for motifs from the worlds of technology, sports or screen heroes. Gigantic flowers, cheerful polka dots, and photographic murals designed by wallpaper artist from across the globe complete the picture. Once upon a time, the choice of kids' bedroom wallpapers was so simple: Pink wallpaper for girls, blue wallpaper for boys, teddy bears and balloons, and a few more cutesy motifs that have always been popular with children - and that was that! Today, the choice might be a lot less simple - but it is also so much more exciting! 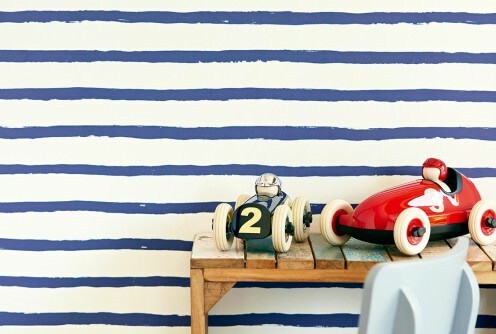 Contemporary kids' wallpaper design is all about action, reaction, stimulating the senses, enabling children to learn by experiencing new things, helping them to understand boundaries and priorities. And those multi-layered reasons are the basis for our kids' wallpapers which cover the wide spectrum of all stages of child development. Popular classics like elephant wallpaper or pirate wallpaper are of course present in our range, but in new and innovative incarnations. Extraterrestrial, out-of-this-world wallpaper designs for children are as much part of our assortment of wonderful wall decorations for kids as clear lines and playful patterns. Discover the universe of design options for your child's room. When a child is born, all he or she needs is warmth, affection, love and security. A child's room plays an important part as it is their own little realm - even though babies will of course not be aware of this for a little while. Everything is new, exciting, the baby starts discovering its own self, its eyes and ears, its immediate surroundings. During the first few years of life, light colours and a cosy atmosphere are the most important factors in kids bedroom wallpapers. Patterns and motifs can be concrete or abstract - but they are always befitting for children. As the child grows older, stronger prime colours come into play, and kids develop interests, favourite themes and characters which can be reflected in the kids' room wall décor. Wallpapers become the backdrop for imaginative play, an inspiring landscape for exploration. Patterns and motifs of kids' wallpapers come alive in their imaginations. But your child's room is not just a space for exciting adventures and play experiences; it also needs to provide relaxing atmosphere. Children need space to get away from parents, school, the craziness of everyday life. When they reach school age, kids also need an appropriate environment to do their homework and study. Learning aptitude and concentration can be fostered by choosing the right children's room wallpaper. Increasingly, friends and acquaintances will come and visit and the focus turns to a more representative character of the room. Once they reach puberty, the former "kids' room" becomes more of a refuge, a private oasis where secrets are kept and friends are received. The child's room becomes a teenager's room - and the wallpaper should reflect their budding personality. Provocative patterns, motifs and colours or unusual materials and structures are de rigeur when it comes to teen bedrooms. 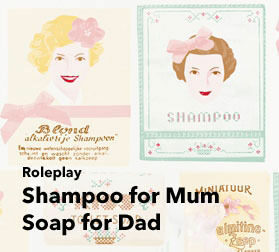 Anything goes - just as long as it is not to the parents' taste! More information can be found in our tongue-in-cheek Guide Blog Cool Wallpapers for Teenagers. Our design wallpapers for children and teenagers meet the requirements for all topics and interests, age groups and genders and allow for creative development. As children grow and develop in many small steps and stages, the interior design for children's rooms is constantly in flux. In fact, children's and teenagers' rooms are the spaces where wallpapers are changed most frequently. One of the reasons for this fact is that interests and favourite topics change as the child grows older. Children's rooms wall décor is often subject to intense use and, as a result, to a lot of wear and tear, spills and stains. As a result, the appearance of wallpapers in kids' rooms will suffer more quickly and it will look worn and tired. Our extensive range of wall treatments for children's rooms is available in paper-based or fleece (non-woven) varieties. This differentiation indicates different carrier materials and characteristics. Recycled paper is the basis for paper-based wall décor, whilst non-woven wallpaper for kids is made from cellulose and textile fibres. The main differences between the two types of wallpaper are the processing method and the ability to retain their dimensions. 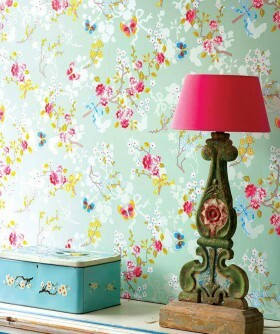 Paper-based wallpapers require pasting of individual lengths of wallpaper as well as a specific soaking time. Non-woven wallpapers can be applied directly to the wall and there are no waiting times. For frequent wallpaper changes, fleece or non-woven varieties are of course an easier choice as they can be pulled off in a dry state and without leaving any traces behind, which obviously saves a lot of time and effort. As for paper-based wall décor for children, there are those types that need to be soaked and then scraped off, but also those that can be removed from the wall in a dry state. This means that the paper (under-) layer remains on the wall. The decorative top layer of fleece or paper wallpapers can be made from PVC, high-quality paper, natural or textile materials. Special metal or effect foils or shimmering glass beads create fascinating light reflections and multi-dimensional structures. The clear favourite amongst kids' room wallpapers is vinyl wallpaper with a washable and water-resistant PVC surface coating. In children's rooms, they are a top choice when it comes to cleaning and durability. 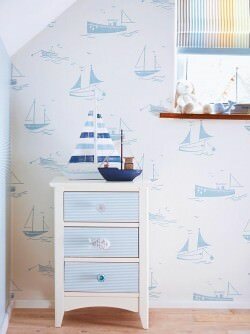 The older the children, the higher their requirements for kids' rooms wallpapers. Beyond just patterns, motifs and colours, special effects and structures are given more importance. We cater for all those demands with our beautiful metal wallpapers or effect foil wallpapers, flock wallpapers and leather imitation wallpapers, any of which will create the basis for a stylish teenage room. Please note that the delicate surface materials of textile wallpapers, natural wallpapers, glass bead wallpapers and flock wallpapers are not suitable for cleaning with a damp cloth and are also more prone to damages. 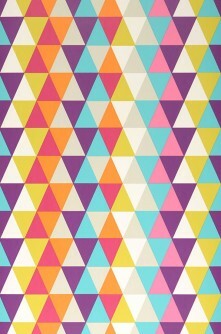 Here is a summary of the pattern and motif themes of kids' rooms wallpapers available in our shop. There is a plethora of design options! 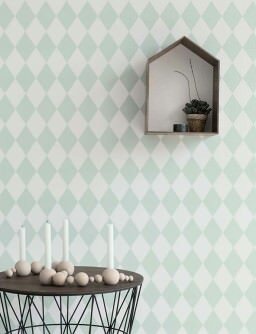 Geometric styles have long been one of the most popular patterns of innovative wallpaper design and have enjoyed a renaissance with the success of retro wallpapers in recent years. Polka dots, stripes, circles, squares, cubes, rectangles, waves and lines unfold their colourful or pastel-light dynamic in our wallpapers for children. Girls and boys alike love animals and many grow up wishing for pets. 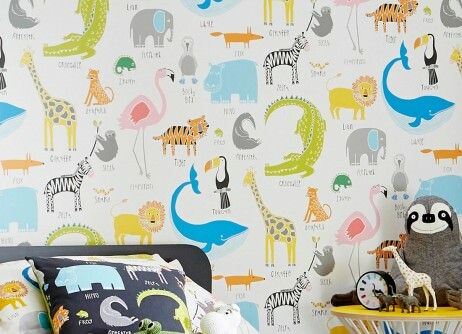 Kids' rooms design wallpapers depict small and big, wild or tame animals. 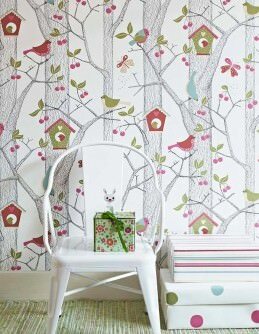 Brightly coloured fish in the water, tropical parrots and flamingos, delicate butterflies, beautiful forest birds, circus elephants, funny sheep, cuddly dogs and cats adorn the wallpaper patterns of our children's bedroom wallpapers. 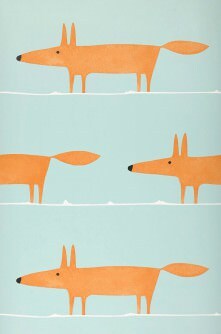 Cheeky foxes and fairy-tale unicorns as well as wise owls invite you to animal wallpaper fun. Galactic Pattern themes: Boldly go where no one has gone before! Let's travel to remote galaxies and solar systems, let's visit the moon or an intergalactic space station to mingle with strange aliens and hi-tech robots. New patterned wallpapers for kids rooms take up this favourite topic in many different ways, whilst leaving plenty of room for creativity and individuality. 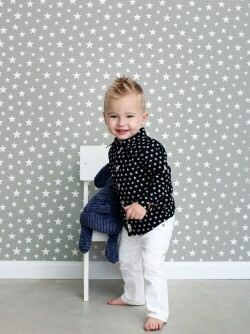 Star wallpapers in a huge variety of styles appeal to children and teenagers of any age. 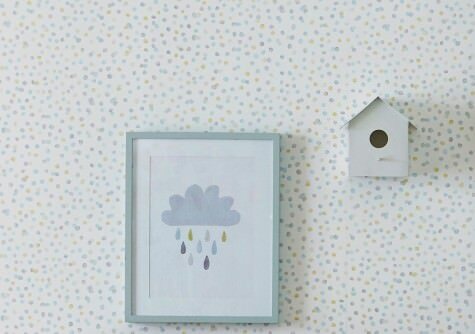 Clouds are one of the most popular motifs for kids' bedroom wallpapers in our Shop. Children associate many different moods and sentiments with clouds, and all of them are reflected in the many motifs we provide. Soft fluffy clouds carry the child into the Land of Nod. Rain clouds with colourful raindrops promise a glorious rainbow. Airplanes criss-cross through the cotton wool clouds. We could go on, but how about checking out for yourself which cloud is the right one for your child? Incredibly authentic looking flowers, or stylised blossoms with child-friendly character - floral wallpaper patterns bring a fresh, sweet air into a girl's bedroom. Our exclusive and lovingly created flower wallpapers for kids' rooms are often combined with other motifs like animals or imaginative ornaments, adding a new dimension to the lush oasis of blooms. When it comes to colours, there is anything from "technicolor" to icy pastel hues. As we are talking about "girl topics" in children's wallpapers, we should mention romantic and nostalgic wallpaper designs. Girls of all ages treat their friendship books, scrap books and diaries like precious treasures and record thoughts, ideas and emotions, often illustrated with nostalgic stickers and drawings. Pictures of girls in times gone by, fairies or princesses, majestic butterflies, fairytale castles or a magic garden are all presented in our wallpapers for girls. Many kids love alphabet soup. But alphabet wallpapers for children's rooms "taste" just as nice, feed the imagination and help with concentration. The letters of alphabet designs for kids' wallpapers can tumble across the wall or be arranged in a crossword or word puzzle, inspiring children to immerse themselves in wordplay. The frame wallpapers in our Wallpaper Shop are a top seller because they provide plenty of space for creativity and change. The frames can be filled with individual favourites, e.g. works of art painted by the child or his/her friends, family photographs, locks of hair, etc. etc. Children are incredibly creative and have plenty of ideas as to what they would like on their own walls. What would a child's world (and that of an adult, too!) be without legendary Disney character Mickey Mouse? Or Spiderman saving the world!? It would be lifeless, without colour, lacking a sense of adventure! 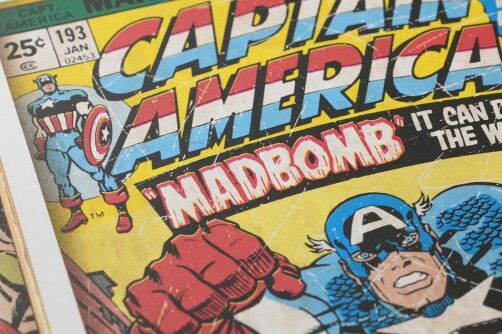 That's why the comic heroes and cult characters in our designer wallpapers for children's bedrooms are a must for true fans! Pattern motifs popular with boys often come from the world of technology and vehicles. 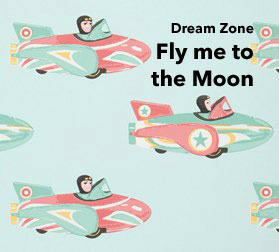 Automobiles, race cars, airplanes, robots, rockets, space ships can all be found on our kids wallpapers. But how these topics are realised, and the way they are depicted, finds new innovative outlets in our fabulous kids' bedroom wall décor.